Sony has unveiled "PlayStation App" for smartphones and tablets, bring social media functions to the PlayStation. At this year's Tokyo Game Show, Sony's Masayasu Ito and Shuhei Yoshida unveiled a new social networking initiative for the PlayStation, entitled "PlayStation App". You can download the App for your smartphone or tablet, and use it to keep up-to-date on all the going ons within your friends on the PlayStation network. It's essentially Facebook but for PlayStation, much akin to Battlefield's Battlelog, or Call of Duty's Elite, but for all of your PlayStation games. With PlayStation App, you can send out game invites to your friends, live stream gameplay, and even connect to your PS4 to be used as a "second screen" much akin to Microsoft's SmartGlass and the Wii U's tablet screen. 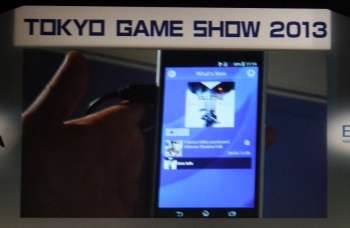 Yoshida demonstrated the second screen functionality live using one of PlayStation's Play Room AR games. He drew pictures on his phone and was able to "fling" them into the game world. PlayStation App will connect seamlessly to NicoNico (Japan's version of YouTube) and other social networks, allowing you to broadcast your gaming habits for the whole world to see. Ito stressed that it is incredibly important for Sony to capture the "casual" market with the PS4, and the PlayStation App is one of their strategies for this. Another strategy announced is the option for gamers to use their full name as their PSN account. He did stress that this was completely optional, but explained that casual gamers get confused by "gamertags", and need to see a friend's real name to understand that it is really them.